Boston, MA (January 17, 2013) According to a new report, the recent recession, with its string of foreclosures that are disproportionately affecting people of color, demonstrates that policies encouraging homeownership as a path to building wealth in communities of color are flawed. The average white family holds significantly greater wealth than the average Black or Latino family, and housing wealth comprises a far greater share of total assets for Black and Latino families than for White families. Being too strongly tied together, housing and wealth-building policies place communities of color at greater risk of downturns in the housing market as happened in the Great Recession. 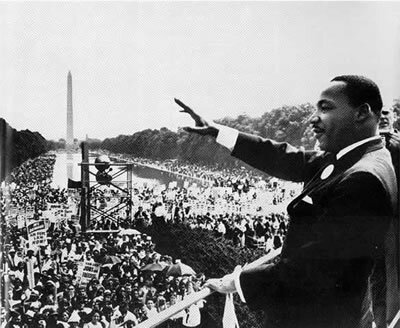 State of the Dream 2013: A Long Way From Home, the tenth annual Martin Luther King Jr. Day report by United for a Fair Economy (UFE), explains that the Great Recession took a greater portion of wealth from Black and Latino families wealth than it did from White families. Today, the average net worth of White families is, respectively, more than six times higher and 5.7 times higher than the average Black and Latino families. Median wealth disparities are even greater. “We focus on wealth disparities because it is linked to a host of other socioeconomic inequities – health, education, income, opportunities and economic security among them. If we seriously reduce wealth inequity, it would go a long way toward resolving many of the other inequities,” says Brian Miller, Executive Director of UFE and co-author of the report. The overall economic well-being of Black and Latino families is more heavily affected by housing value than it is for White families. On average, home value accounts for roughly half of the total assets held by Latino and Black families, but only 28 percent of the total assets held by White families. 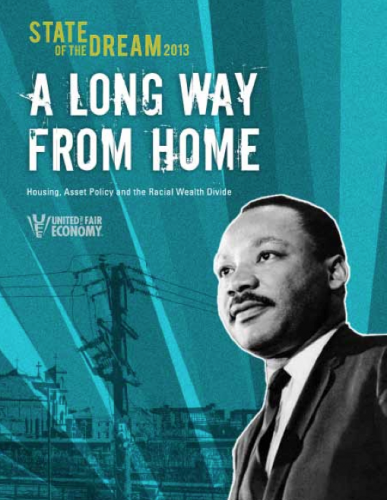 UFE explores how federal housing policy impacts wealth disparities among White, Black, and Latino families, noting that there are benefits to homeownership for families and communities, but that there are also drawbacks to tying wealth to housing to too great a degree. The report argues that federal investments in housing policy should be directed more toward treating housing as a human right and less toward encouraging homeownership as a wealth-building strategy. Encouraging alternative models that build community wealth, such as cooperative ownership structures. Visit www.faireconomy.org/dream/2013 for an embargoed copy of the report. Co-authors and partnering racial justice advocates are available for interview. United for a Fair Economy is a national, independent, nonpartisan, 501(c)(3) non-profit organization working to raise public awareness of the destructive effects of concentrated wealth and power and supporting the movement for greater economic equality.